Applying bushcraft skills on a journey in Ontario, Canada. Photo: Ray Goodwin. We were sitting high up in a mountain valley overlooking trees and surrounded by peaks. We’d set up our tents on a small, relatively flat, grassy area. The nearby stream provided us with water and we had collected up some firewood. As our small campfire became established, it didn’t seem particularly important. It had been a hot day, we had sweated our way up and out of the main valley in the afternoon sun and in the evening it was still pleasantly warm. In the distance we heard a deer bellowing. As we listened and heard it again, we were able to focus in on the animal’s position. He was on the far side of the valley above the tree line and we watched him moving up the far slope as he continued to bellow intermittently. As the sun ducked behind a ridge and the air temperature dropped, cloud started to descend on the peaks surrounding us. Now the fire became more important, particularly as the light faded. The warmth and light of the fire was much more homely than the petrol stove we also carried with us. The previous day, lower down, I’d found wild strawberries growing on a bank near where we had pitched our tents. I fetched my mug and excitedly gathered the berries, collecting half a pint of the delicious fruit. I had been shown wild strawberries as a child in Snowdonia and I recognised them well. My hiking companion, however, wouldn’t be convinced that they were edible. I didn’t try too hard to persuade him, though, as I knew how tasty they were! I was with a friend from university and we were undertaking a backpacking trip in the Spanish Pyrenees. We had devised our own circular route, taking in part of the Haute Route in an easterly direction then joining this up with part of the GR 11 long distance footpath to go back west. This was back in 1997 and interaction with nature of the kind described above was becoming an increasingly important aspect of the journeys I was making. These experiences were available to me precisely because I was planning and undertaking trips. I was putting myself in the position where I could have these experiences. For me, bushcraft and adventure have always gone hand-in-hand. I was having adventures, applying basic bushcraft skills and looking for wild foods even before I sought out any formal training to take my skills further. In addition to hiking with friends, I completed a lot of solo backpacking trips. Many of these were in remote parts of Scotland, where as well as learning to avoid midges and hypothermia, I also sharpened my navigation skills. One of the reasons I chose backpacking was that once you have some basic camping kit, it’s a cheap way of getting out into remote places. Scotland also wasn’t expensive to get to. 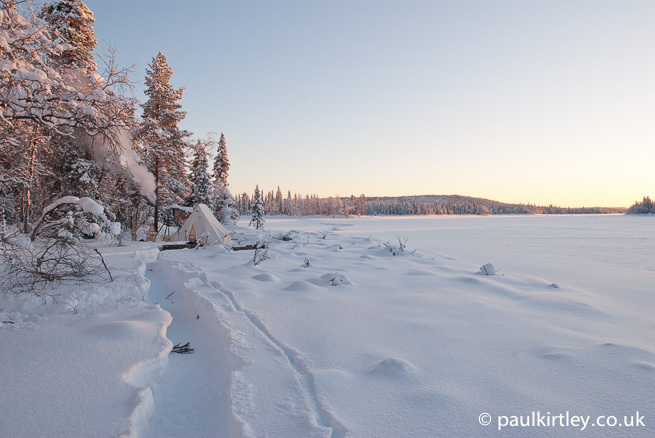 Even the wild areas of Europe were only a cheap flight and a few train and bus journeys away. Even though these experiences were inexpensive, they have proved very valuable. They went a long way to forming my outdoor skills – and mentality – as they stand today. Ultimately, when it comes to outdoor skills, experience is king. Reading books can give you insight into the experience of others but reading does not equal experience. 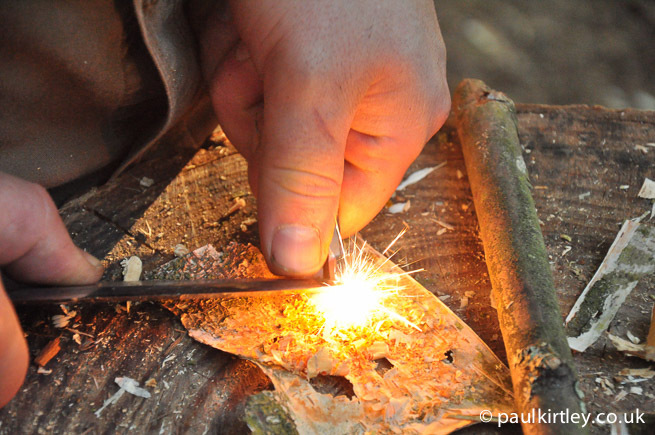 Bushcraft courses are great for gaining skills in a focused, efficient way. Whether the course covers the basics or is more advanced, perhaps providing insight into your personal ability to depend on your skills, the fact remains these courses are still training. However much you suspend your disbelief during a course, at the end of the day it is still a course. There are instructors. There is a syllabus and there are desired learning outcomes. There is a structure, maybe even a timetable. You are being supervised, looked after or monitored, even if it’s from a distance. You can leave whenever you want. Just click your heels together or say the word and you can go home. Not so with a real wilderness experience. For those who do not live or work full-time in wilderness, our experiences of wild places typically come from undertaking our own trips or joining expeditions. Undertaking a trip or expedition is a very real way in which you can test your existing skills and gain experience. Experience is important in terms of application of your skills as well as making good judgments in the great outdoors. Experience should be built up, just as you would seek to build up skills and knowledge. Self-reliant trips are one of the best ways to access wild places, have an adventure and increase your skills and experience. There are numerous ways in which you can undertake a journey under your own steam. You can explore waterways by canoe or kayak, you can traverse frozen lands by ski or snowshoe and, of course, you can hike wherever your feet will take you. Some of these modes of transport – as well as the places you can utilise them – and more accessible and inexpensive than others. Hiking is often overlooked but it is a cheap and healthy way to access some fantastic and rugged country. Backpacking is inexpensive and it’s relatively easy to organise a trip, particularly if you are travelling within Europe. All you need is your camping gear, backpack, some relevant maps, a little bit of research and a cheap flight. Hence I started with backpacking. Then later, as I built up the requisite skills and set aside the funds, I was able to undertake wilderness trips by ski, canoe and snowshoe. Of course, with the aid of modern equipment, you can undertake all manner of wilderness journeys without the need for much bushcraft. But this forces you to travel in a bubble where you are very dependent on the equipment. At the very least, journeys such as snowshoeing trips with a toboggan and heated tent require a good level of local environmental knowledge in addition to efficient fire-lighting abilities and skill with an axe. And that’s if everything goes right; what happens if the tent burns down? 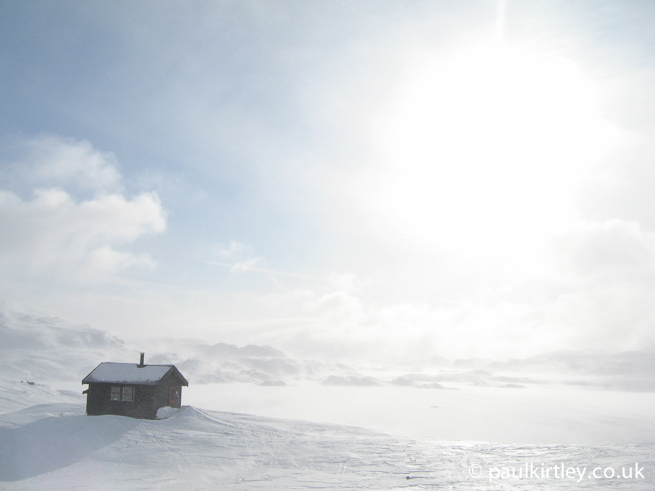 Do you know how to build an emergency shelter for when it’s 30 below? Of course, a tent fire is unlikely but not unheard of. As an example it illustrates the point that knowing how to look after yourself is an important part of travelling with confidence in a given environment. It doesn’t make you less careful but it does mean you are more capable of dealing with things when they go wrong. Winter camping in these conditions requires a baseline of proficiency in fire-lighting and axe skills as well as a good understanding of the environment. Photo: Paul Kirtley. There are numerous benefits to applying your bushcraft on journeys. Bushcraft gives you three things: practicality, capability, and flexibility. Practicality: Bushcraft gives you practical skills – the ability to light fire, build or site a shelter, find water and make it safe to drink, feed yourself if necessary, or augment the food you already have. My definition of bushcraft is wide and includes navigation. Even if you don’t include map and compass skills, natural navigation certainly falls within most people’s definition of bushcraft. Knowledge of natural navigation increases your ability to find your way. It’s not separate from other navigational skills. Nor do you have to choose between using natural navigation or a map and compass. In fact, you’ll be a better navigator for using them together. You should take this approach with all of your skills; mix and match, blend them together and make them work for you given the circumstances – a simple example would be to take a stove on a hiking trip for convenience but use a fire if you are allowed to, you want to, you’re low on fuel, your stove fails or your companion has fallen in water and needs warming up along with their clothes drying out. 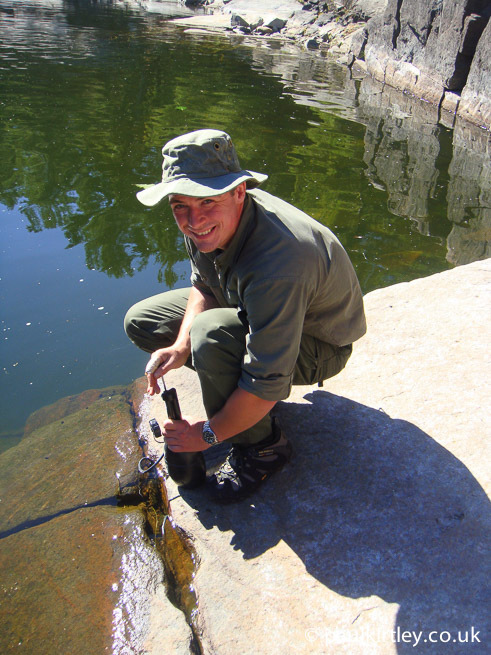 A good understanding of elementary bushcraft allows you to apply the appropriate technique, such as here with water purification in Canada. Photo: Amanda Quaine. Capability: Bushcraft makes you more capable. It makes you more capable of looking after yourself on a day-to-day basis during a trip, it gives you backstop skills you can draw on in difficult or emergency situations, and bushcraft skills make you less dependent upon much of your equipment. Bushcraft techniques learned in other environments or practised in your back yard may even improve your capabilities beyond those of local people. 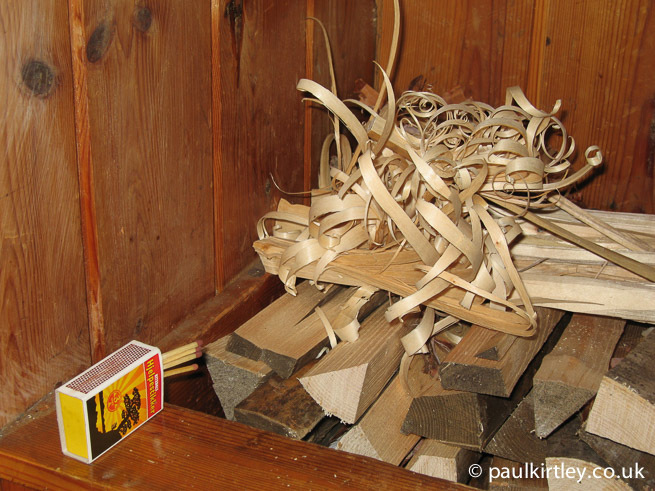 You can find yourself using your bushcraft skills in unlikely places; Even in a barren, winter landscape high above the tree-line, being able to make good feather-sticks can allow you to get a stove going quickly when you arrive at a remote cabin. All of this capability helps you develop a positive, can-do attitude that is not easily subdued. A positive mental attitude is, in itself, very valuable. Leaving the wood pile in a remote cabin as we’d wish to find it. Photo: Paul Kirtley. Flexibility: Competence in bushcraft skills, for example the ability to light fires in multiple ways, not only improves your confidence in the outdoors, it also improves your flexibility in terms of how you approach a given situation. Rather than having to stick to one rigid way of doing things, you have multiple options at your disposal. This gives you practical flexibility, which in turn leads to greater degree of mental flexibility. Competence in relevant skills developed close to home can be put to efficient use on trips. Photo: Duane Yates. While you can, to a degree, develop these abilities and attributes closer to home, it is taking your skills and using them on a wilderness trip that really gives them teeth. “To adventure in the natural environment is consciously to take up a challenge that will demand the best of our capabilities – physically, mentally and emotionally” – Colin Mortlock, The Adventure Alternative. Making a journey through wild country is a sure way of finding out what works and what doesn’t. Nature has a way of exposing your weaknesses. This includes your mental attitude. You can’t con nature or persuade it round to your way of thinking. Things work or they don’t. Supposition and theory are replaced by hard reality. Any weakness in necessary skills will be exposed, often when it is least convenient. Typically any weakness in your equipment or planning will be highlighted. From this pain, however, you also gain. You gain valuable experience. You are able to make a real-world assessment of your skills. Wilderness trips develop resilience in your mental attitude, your skills, your planning and your equipment. Physically you improve your stamina and mentally you improve your resilience as well as your confidence. Your bushcraft skills are improved in multiple ways too. Using specific bushcraft skills on a daily basis while on a journey is a great way to hone them. Literally you will be applying your skills in a ‘live environment’. No instructors. No supervision. No quick way back to Kansas, even if you do click your heels together. This application gives you a good understanding of the reality of using these skills as opposed to just practising them. Using bushcraft skills on a journey really improves your efficiency in applying them. This is for three main reasons: First, relying on a skill, rather than just practicing it, focuses your mind on getting it right and making it work; Second, because you are using the skills repeatedly, you become more fluent; Third, because you have to use the skills as part of your daily routine you don’t waste time with them. When you need to spend much of your day travelling from A to B, setting up camp, getting enough sleep, then taking down camp again, you will become much speedier and more efficient in applying all the skills specific to your trip. After a hard day paddling on a canoe journey, the longer it takes to identify and collect good kindling and firewood, find a decent sheet of birch bark and get a fire going, the later you will eat and the less sleep you will get. This will have a clear knock-on effect the following day. So as to avoid this, you become more efficient. 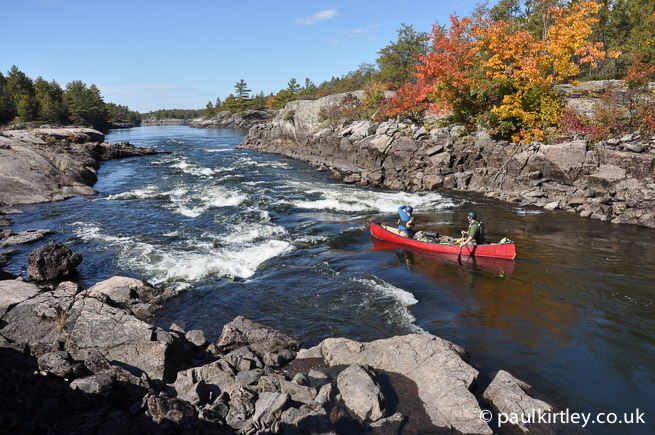 On a wilderness canoe journey, you’ll spend a good deal of time just getting from A to B. When you come to apply your campcraft and fire-lighting skills, for example, you’ll want to be efficient. Photo: Hamish Morton. Making journeys into new areas gives you a greater appreciation of what’s important to know for a particular environment, especially in terms of the skills you need to master. This encourages you to learn new bushcraft skills to fill in gaps in your skill-set, as well as gaining new knowledge about the nature of the environment. It is generally true that new environments require new learning, both in the preparation phase of your trip as well as the expedition phase. As already discussed, weaknesses in your skills, equipment, planning and preparation will be exposed. Use this as a learning experience, make notes and feed this back into your preparation for future trips. Another extremely important aspect of overseas trips can be the opportunity for cultural exchange. Sometimes you are lucky enough to meet with people who use their bushcraft skills on a daily basis in the environment you’re visiting. This can be a great chance to gain insight into skills and knowledge specific to the local environment. It can also be a great opportunity to discuss and exchange more general skills with indigenous people. 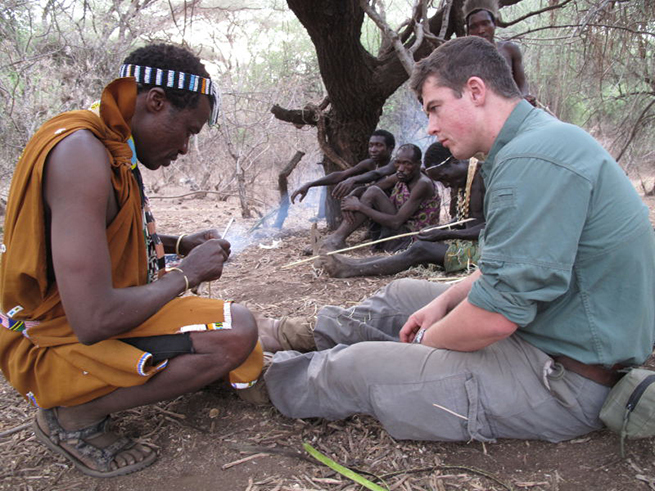 Cultural exchange: The author learning bushcraft skills from Hadza hunter-gatherers. Photo: Amanda Quaine. 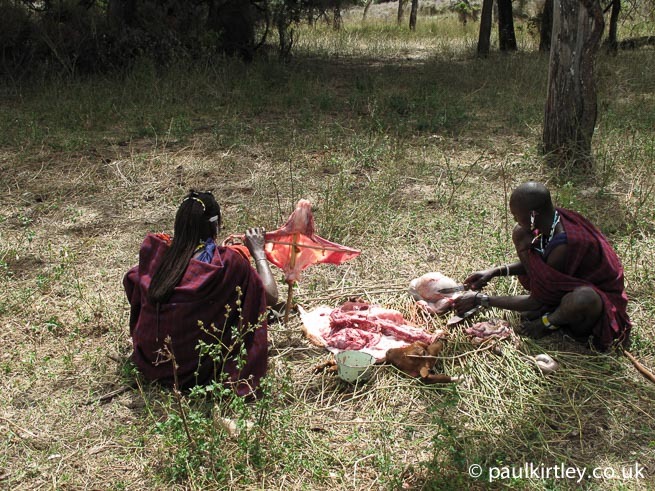 Much can be learned from observing indigenous bush skills. Some of it is specific to the environment, while some of it can be applied in other environments. Photo: Amanda Quaine. 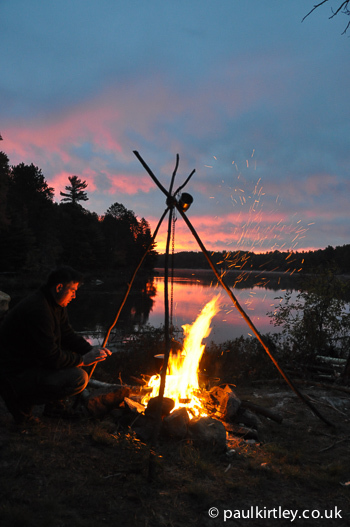 Bushcraft provides a richness, resilience and self-reliance to your wilderness journeys. In turn, adventure in wild places refines, tempers and hones your bushcraft skills. This is a virtuous circle and one that is definitely worth entering into. Got to end of first paragraph had to stop…to prepare for what came next…a brillant article ! I always enjoys your blog Paul, and this is particularly inspiring stuff. The idea that bushcraft complements / informs / enhances / is part of other outdoor activity very much resonates with me. Thank you Dave. I’m glad the core message resonated with you. Nice one Paul, I particularly agree with your views on ‘real life’ usage streamlining and honing your skills into fluidity through necessity. Will you be at the canoe symposium at the end of the month? If so it’d be cool to catch up there. Hi Paul hope your well. Another cracking article. I couldn’t agree more that relying on your skills and practicing them are different animals. Only with experience can knowledge prove its worth. I’m very well thanks and I hope you are too. Yet another great article thank you. I only started practicing bushcraft in April last year but I always try to envolve it in every eventuality I can, even though I have only been out on camping and hiking trips in my local area. But simple things like knife skills and knot tying etc I try to use them in every day situations, I also enjoy going to new woodland to explore and/or camp so a lot of skills come into play ie map reading, fire lighting, camp setting up etc etc. My thirst for knowledge in this field is never ending so thanks to your good self plus books and Youtube I am learning all the time and look forward to putting that gained knowledge into practice in as many ways as possible. Thanks once again Paul for all that you have taught me. I’m glad you liked this one. It sounds like you are already gaining a lot from learning and employing bushcraft skills in your outdoor life. It’s a great journey to be on. Great article Paul. I love reading about bushcraft skills and the philosophy of such. keep me on the email list. Hi Paul, enjoyed the article very much, very well written. I completely agree with everything you have said, just knowing something by reading and observation is not the same as having practical hands on experience. Taking things a step farther and putting yourself in a situation where you must rely on what you have practiced to get you through is a whole different mindset once again. I have had the good fortune to grow up in Ontario Canada, with endless wilderness within a 2 hour car ride my entire life. I have been on many canoe trips, camping trips and hunting trips. I have developed my skills through out the years to the point where I feel completely comfortable and confident venturing into the bush with a minimal kit and the skills and knowledge to thrive with it. Don’t get me wrong, in no way do I think I know everything, I still have so much to learn, but the skills I do have give me the confidence to enjoy the wilderness fully. Each new skill gives you another platform from which to push yourself even farther from, and new skills develop from there. Bush-craft and woodsman skills are a life long education, you can never know enough, you can never know it all. I wonder if some time in the future, you might address the disabled. I have arthritis and, though I find bushcraft exciting, I am not able to enjoy strenuous trips. I still get out there, but I need some practical tips for trips like yours. It’s good to hear from you. Yes, I understand how tough arthritis can make things. One person’s tough trip is another’s walk in the park though. We can all find a level that we find challenging. That’s not meant as a patronising comment. Rather, when you have an adventure, it’s your adventure. It’s a personal thing. Even those who are with you on a trip will have a different experience. Moreover, what we find challenging at one stage of life or level of experience, we will find easier or harder at another. The important thing is that we challenge ourselves, as much for the place it puts us mentally as well as physically. Great insight into the Kirtley Brain. I totally agree. It wasn’t until I did the Spey canoe trip in a rather cold November with Ray Goodwin and a few hardy people that I appreciated that it is a combination of just having a go spirit and knowledge that made these trips epic .A big turning point in my life. All I can add is sometimes just getting out the door is all it takes. If you don’t make space and time for the big rock experiences then your life gets filled with sand and your photo album look a little sparse. Hi Paul Great article. I gave my students at the college your web site as a must read because of all the great articles you have and this one pretty well hits the nail on the head once again. My students train this semester then go to tough foreign fields for a semester. I have taught over 100 students your one match fire technique and am amazed how well it works. I let them try it their way then after little success I show them your way. Invariably they get success where there was failure and a smile replaces the frown of frustration. I’m glad to hear that you are still teaching and inspiring young people to go out and enjoy the wilder parts of our world with increased confidence and skill. It’s good to know they also find this site useful in that journey. Thanks again for recommending my site and the information it holds. It’s much appreciated. I have read Nessmuk. You are right, I do enjoy it. It’s a great little book. Spot on as usual: an inspiring and thought-provoking read. I’m lucky enough to have begun acquiring skills before “bushcraft” became so mainstream. At 73 I’m still learning. You are so right, here and in your recently posted lecture, than skills should contribute to experience and not be learned in isolation. I remember a trip in the 70s across the US living in the National parks for 10 weeks where I was taught by a mountain man the virtues of pine resin for lighting a fire in wet conditions. If only I had known the week before I would have been spare the sight of a wife and two small boys eating cold, uncooked porridge with reproachful eyes because I couldn’t get a fire going- boy did I feel inadequate! I can testify from personal experience that the skills you teach do indeed build confidence and self-reliance, which in turn leads to self-confidence applicable to all areas of life. I hope your readers will develop and employ their skills to build up many memories like yours which will enable them to look back on happy times in later life. Like Jim who commented earlier, I am also disabled and very restricted in what trips I can take. I can’t hike into the forests or climb mountains to get above the tree line (as much as I would love to do these things and more), but living in Scotland there are plenty of places that you can still practice bushcraft skills. A drive into the Highlands and stopping somewhere remote for a brew can still incorporate organising a shelter, fire lighting etc. Ok I can’t ‘rough it’ anymore, but practicing what I can do when I can gives me the confidence that from blogs like yours, YouTube and Lofty Wiseman’s excellent survival book, I know that if I were stranded on one of these remote roads (invariably with no mobile phone signal to summon help), I would be able to survive reasonably comfortably until help arrived. Keep up the good work, Paul – maybe we’ll see a blog that incorporates disabled bushcrafters, and how they adapt bushcraft skills for themselves, in the not too distant future. Thanks also for your perspective on how bushcraft skills fit in with your life. Over the years I’ve taught some disabled individuals who have had incredible determination, often working harder than their more able-bodied cohorts. This is something I’ve found incredibly inspiring. Last winter I attended a night of talks at the Royal Geographical Society, hosted by Sir Ranulph Fiennes in benefit of his charity. One of the speakers was Geoff Holt. His story is inspirational enough but his spirit, positive outlook and humour was incredible. I don’t think Paul would mind my response here, not to infringe on his blog. My wife was diagnosed with Retinitis Pigmentosa, a debilitating eye disease that destroys night vision. She also was born hearing impaired and wears two hearing aids. My love of the outdoors has encouraged her to follow me out there. She loves to hike, and I whittled a willow staff for her to hike with. She cannot see in the dark, so I take her hand if she needs to stroll to the outhouse, and she adapts. She can make fire with a ferrorod, use a knife and make not bad feather sticks, and she can bake a cake on the open fire. Just get out there man, and enjoy the nature all you can. It’s free and the freedom you will feel far outweighs the disability people say restricts you. Great piece Paul, in a lot of ways I view “adventure” as building blocks for self exploration. In this day and age its hard to find something in which success and failure is 100% up to you. Bushcraft (in my opinion) allows you to slow down and grow as a person by adopting skills and techniques that allow you to accomplish a goal(s) solo- nothing better than mastering a situation by utilizing a skill that you have performed so many times before that it becomes almost natural. Thanks. I like your outlook with regards to adventure. Glad this gave you itchy feet again. Where did you go on your recent adventure? Our place in France, its about 4 acres with a 1 & 1/2 acre lake. An interesting one on this trip was that after setting a trap in the loft (usually its just mice) but this time the culprits were Fat (or Edible) Doormice. The romans used to fatten them up and eat them and as I’d never eaten one before I was keen to try. HOWEVER, they are cute and my wife, who was accompanying me on this trip threatened all kinds of repercussions if I did so I had to release them (I caught 2 in total). I did say to her that as a survival instructor I had an obligation to find out what they taste like but the look I got told me I should wait til a future trip (when she’s not there). Take care and keep in touch. I always enjoy your posts, they are always well researched and informative. Bushcraft is a way of life that a lot of people will never understand, that makes me sad. I liked your comment to the gentleman who asked about the idea of a post for the disabled. I am unfortunately disabled and can not get to the places I love . However my Local State park has made accomodations for people like me. They have a well maintained wheelchair accessable fishinf pier. a wheelchair accessable hiking trail with various placards describing the trees and plants. Lastly they have wheelchair accessable campsites with fire rings so we can play with fire. I also appriciate your views on bushcraft in general. The British ways of doing things is a bit different than the way we do things here in the US. It gives a whole new set of mind sets and skills to play with and improve our selves. Looking foreward to your next adventures and vids. You’ve shown that great skills and a great attitude will lead to sucessful adventures. Do you think that a positive mental attitude can be taught? I think it can be modelled so that a willing student can copy the behaviours related to it if they are motivated to do so, but I would love to know how to teach a good attitude so that I can help the Cubs and Scouts I work with. Some shine so bright and others are so hard to reach. It would be great to be able to help all of them progress. Keep up the good work, I look forward to each of your blogs and follow your adventures, especially the canoeing trips in Canada with huge interest. I strongly think that basic knowledge, maybe from books, is essential to start with bushcraft and at the same time bushcraft itself give you the rest. Only facing bads teaches the solutions! Hope I right understood the point of your post! Travelling light, on a budget, planning ahead, planning in emergency, team work. There are times when I do the luxury travel…hotels, trips, journeys…then I return back to explore further to soak into the scenic beauty of place…travelling grows on you. There is nothing like just being with nature taking in her beauty….Each place is an experience…teaching you. I hv learnt to bring my bushcraft skills to holiday travel…..i am slowly looking at Europe and thinking…this can be done differently……once you are out there….you learn, realise, and adapt….and slowly venture away from touristy spots………navigation skills come in handy where I know my maps, easy reach places …….I track …learning to be simple…. And yet enjoy . ….because I know some basic principles ….i boldy explore to a wee bit outside my comfort zone….I’m looking at Sedona…and thinking…ok…to keep costs low hiking this trail…driving this way…….i would hv just booked a tour……but now I’m learning to think differently….what do I want out of this trip…….it’s funny…..because bushcraft does change you….nature is something that is stupendously beautiful….and enjoying it while being safe, using time tested principles…makes it all the more accessible…doable…and enjoyable! A particularly inspiring blog!! It has taken me the most time (and effort) to change my lifestyle so I can fit in more outdoors activities, to move them up the priority list from wishful thinking to semi obsession! There is a confidence to be gained if you are going to succeed as I have encountered derision in places and even borderline hostility in others, you are going against the grain of modern society as many people in the UK seem to feel they need the excuse/permission of walking a dog to be out in even semi wild places or a sport involving the purchase of several hundred pounds worth of Lycra. They don’t like that you don’t have your excuse/permission even though some have little control over said dogs and are more of a potential menace than you’ll ever be. I’m slowly finding the real outdoors people (as opposed to the gear snobs who’ve replaced the Lycra with Gortex and Titanium) and it’s well worth it in the end and look forward to the day I can write a blog on this subject even half as inspiring!! Keep on your journey. Enjoy being out for the sake of being out. Don’t be deterred. Again a great article. Could not agree more about going bush and putting into practice what you learnt or read. The more you use your skills then you find the outdoors just becomes second nature and you can enjoy your experiences. With out a second thought on what you need to do to enjoy the out doors. Back packing with different people also helps, finding out what new gear is available, what food they use, what skills that can be learnt from them also. A collective pool of knowledge as it were. Then you can use this knowledge to best suit your own situation as needs be. as usual this helped hone my other learned outdoor skills, plus it was very interesting, thanks Paul! Hello Paul! Loved the article. I am a complete noob to bush-craft… but I’m planning a “Dry run” in the back garden with my son. I do not have much in the way of equipment, mainly a single skin tent and a couple of “Ground sheet” style tarp’s, one to add a second skin to the tent, and the other as a porch, maybe! I am currently residing in Ireland where you give the weather 20minutes and it’ll change! 🙂 O.K. So not that bad, but it is wet over here! there is a small wood about 5miles down down the road, and when I am confident enough and equipped with a good sleeping bag, sleeping mat, and a light-weight tarp/tent I’m going to plan an overnighter. But as I’m on a tight budget it is taking a long time for me to get out into the woods. If you or any one reading this know of where I can find good CHEAP equipment I’m all ears! 🙂 Thanks again! Ok, here are my comments, for what they’re worth. Wilderness trips do refine your skills. There are many ways to practice fire making and all are rewarding, but practically, the fire lay and type of wood is the most important. Fancy gadgets, or primitive fire starting is irrelevant if you cannot produce the type of fire you need for the situation. Do you need a cooking fire or a hot blaze to dry out? What are you cooking? Do you need coals or just plain quick heat? These come from the journey, as each day will not be defined until it comes upon you. Likewise, I have played with many knots, but essentially, all I ever really needed in the wilderness are perhaps 10 essential knots that serve the most use throughout, including the humble bow tie! As for camp set-up, that becomes a preferred routine which is unique to you. My camp is not your camp. My bed is not your bed (unless you’re my wife ;-)). And, when travelling with others, it is such a learning opportunity as everyone gathers at the evening fire and shares experiences, laughs, and even a deep heartfelt revelation. Or, you simply smell the smoke and listen to nature around you. Expeditions are not static, their are dynamic, and as such, things are spontaneous, fluid, and unpredictable to some extent. It is wise to take advantage of lighters, matches, and the occasional modern amenities, unless it’s a lean survival exercise, or you’ve just joined the SAS.